Stephen O'Connor, general manager, Harbour Hotel; Aoife Miller; chef Jean Claude Emverivi; head chef Patrick Anslow; and Dan Regan. Dillisk on the Docks is celebrating its first birthday this week, and what better birthday present than being awarded its first AA rosette for culinary excellence. The excitement did not stop there as Harbour Hotel Galway, where Dillisk on the Docks is located, also received four-star status. One of the most prestigious awards in the industry, the rosettes are given for quality of cooking and are similar in standard to a Michelin Star. AA rosette awards are assessed as part of unannounced inspections and are a hugely respected accolade in the industry. These rosettes are awarded to restaurants serving food prepared with care, understanding, and skill, using good quality ingredients. These restaurants will be achieving standards that stand out in their local area. Dillisk on the Docks opened its doors one year ago and the innovative cooking based on mouthwatering flavours, local seasonal supplies, and fresh artisan ingredients by head chef Patrick Anslow has proved to be a winning formula. Dillisk on the Docks is based in the Harbour Hotel, situated on the docklands of Galway only minutes’ walk from the city centre. Stephen O'Connor, general manager, said: “We are absolutely thrilled with the AA rosette. The main ethos behind Dillisk on The Docks is authenticity, local, delicious, and remarkable food and thankfully this has proved successful. We aim to consistently provide our customers with impeccable service by demonstrating authenticity and warmth with knowledge, professionalism, and integrity in our work. A huge thanks to all the team that worked in Dillisk on the Docks since its inception a year ago. The rosette is for them, and because of them. 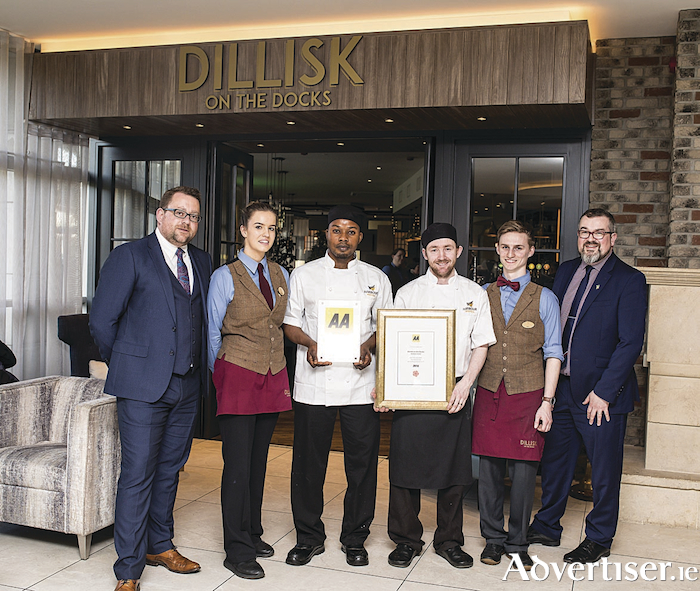 AA inspectors were impressed by the range of dishes served in Dillisk on The Docks, which is overseen by Harbour Hotel head chef, Patrick Anslow, who leads a team including Gary Meehan, sous chef. The Harbour Hotel, which recently renovated and upgraded its bedrooms, is owned by Galway couple Marie and John Lally and forms part of the hotel group MHL Hotel Collection owned by John Malone, John Lally, and Paul Higgins, including newly branded The Galmont Hotel and Spa, Glenlo Abbey Hotel, The Limerick Strand Hotel, The InterContinental Dublin, The Westin Dublin, Hilton Hotel Charlemont, Trinity Hotel, and of course Harbour Hotel. Many of the team at Harbour Hotel are from the west of Ireland, others have been captivated by the charm of life in Galway city and have decided to call it home. All share a passion for the culture, spirit, and beauty of Galway and enjoy sharing the best of their local knowledge with visitors to the area. This commonality instils a sense of community within the team at Harbour Hotel, they take great pleasure in working together to create a friendly, inviting, atmosphere where guests feel comfortable and well taken care of. When you stay at the newly awarded four star Harbour Hotel in Galway city you can expect excellent service from people who enjoy what they are doing and want to help you to make the most out of your stay. Harbour Hotel, New Dock Road, Galway, phone (091 ) 894 800. See Facebook @dilliskonthedocks, Twitter @Dilliskotdocks, and Instagram @Dilliskonthedocks.